Published October 26, 2013 By Anna T. This post may contain affiliate links. Regardless, I only recommend sites I've researched and/or used and trust. Intuit is a very well-known company that you've likely heard of. They are behind the popular QuickBooks, TurboTax, Mint.com, and several other things. What you might not have known is that Intuit hires people to work from home as tax advisors. These are often seasonal work from home jobs, although you will sometimes see them advertise for year-round workers. If you have the right credentials and would prefer to avoid the daily commute, Intuit might be a good company to consider working for. I have done some research on their home-based tax advisors positions and provided those details for you below. Intuit hires tax advisors in the US and Canada. How much do Intuit tax advisors make? The rate of pay isn't listed on the website, but it's rumored to be $18 per hour, possibly a little more. Apparently Intuit's tax advisors used to get a really nice bonus in addition to their pay — up to $8,000 per season — but I don't see mention of that on the current job posting, so I'm not sure it's anything they still offer. For more high-paying positions, you can check out this list of work at home companies paying $20 or more hourly. 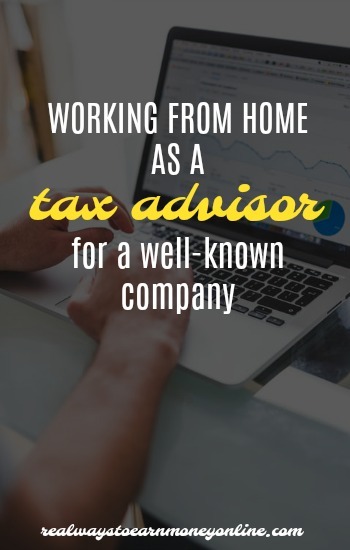 As a tax advisor for Intuit, you work from home helping out customers who contact Intuit about their TurboTax products. You'll be handling inquiries that come through via phone, email, and chat. I did read on one of the work at home forums that where someone had this job previously and only handled email and chat inquiries, which essentially means her position was non-phone job. However, I don't think you can choose that option when you apply. From what I read, it sounded like Intuit decided to let this person handle email and chat only because she was better at those kinds of inquiries. Extensive knowledge of tax laws. Experience using major tax preparation software. Experience with electronic filing a plus. Minimum 5 years experience preparing federal and state returns either individual (1040) or business (1120, 1120S, 1065, 1041, 990, 706). Able to research IRS and state publications, regulations, and GAAP publications. Experience discussing complex tax topics or situations. Must have excellent verbal and written communication skills. Bilingual a plus. Strong software troubleshooting abilities a plus. Intuit usually has both full- and part-time remote positions available. If you are full-time, you can expect to be working about 40 hours per week, and part-time may be around 30 hours per week. Someone posted about their Intuit seasonal tax advisor interview at Glassdoor. This person applied through a recruiter and claimed the entire process took three weeks. There was a two-part test, the first part covering your tax knowledge and the other part covering your English skills. If you make it through that, there is a phone interview. The test and interview is supposedly not terribly difficult if you know your tax stuff, but you need to have your reference materials handy in case you get a question you're not sure about and need to look it up quickly. The bullet list below will take you to various places online where this position has been discussed or reviewed. The forums don't have a ton of feedback from people who are actually doing or have done this job, but there's a little there. Overall, it seems everyone has had a fairly positive experience working from home for Intuit. If you meet the qualifications and know you can put in the hours, this would probably be a good job to get. You will need to visit Intuit's website to see if they currently have openings for remote tax advisors. Type in “remote” in the job keyword search box at the top of the page. If they have any openings, you'll see them listed. Good luck! Are you interested in similar jobs? Check out the list of work at home jobs for accountants and bookkeepers in my directory. Looking for more work at home phone jobs? If so, you could try FlexJobs, a site I personally use and trust. They post hundreds of new remote and flexible jobs every week across every category you can think of, and they are one of the only sites that can guarantee their leads to be scam-free. It's $14.95 a month to gain access to the company names in their listings, and there is no obligation to keep your membership after one month if it doesn't prove helpful for you. Hi there. I applied for this position back in June and was told hirin would begin late July/early august. The process began with an initial phone screening with a recruiter followed by the online test you mention above. As you said, the test is not very difficult. So I call the recruiter in mid August because I have not heard from her. She tells me hiring will not begin until the end of the month. So they first tell me en of July or early august and now it’s the end of August. Ok fine, not a big deal. I call her again in the beginning of September because she has not reached out to me. I leave her a voicemail. No call back. I call again at the end of September and leave another voicemail asking her to let me if I’m still in the running. There are other opportunities out there that I was looking to pursue. I I ally get a call back from her in mid October! Terrible response time by these people. I interviewed on 10/23 and was told to expect a response in 1-2 weeks. Given their previous lack of promptness, I don’t expect to hear anything for 2-3 weeks. Quick note, I was told interviews would be taking place fr 10/23-10/25. Tough interview too.